Welcome to the age of social media in the NFL. It seems that a lot of football fans like me weren’t the only ones baffled by Cutler’s decision to not play (although the official line is that the team doctors wouldn’t let him return) in the NFC championship game after the first half. Some current and former players are wondering what in the hell he was doing. 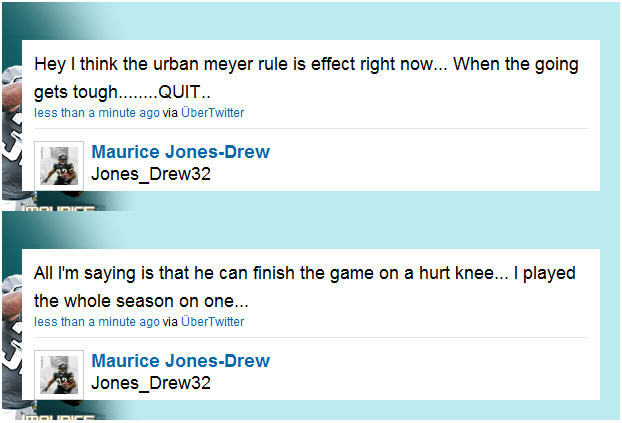 Jacksonville’s Maurice Jones Drew is among Cutler’s colleagues who thinks it was a chump move. Here are his tweets. First of all, as a Tennessee fan, I appreciate the Meyer reference. And second of all, he appears to be right. It looked like Cutler quit on his team. My prediction is that we’ll see some Bears players voicing their anger with the prima donna QB over the next couple of weeks. Like some other players have pointed out, if you can stand on the sideline, your knees not hurting that badly. This entry was posted in Misc and tagged cutler didn't really hurt his knee, cutler quit, maurice jones drew says cutler quit, other players critical of cutler. Bookmark the permalink. The only ones convinced that Cutler didn’t quit are “some” of the Bear fans. Does it really a point for him to have a MRI scan? I hope the Bears does not have to spend for it. The blog in http://www.chicagonow.com is blamign the rest of the team but Mr Cutler. Tell that to the 3rd string QB how he was able to pass better in one period compared to Mr Cutler. Cutler quits ‘coz he does not want to have no reason why the Bears lost the game with him as the starting QB, period. That has always been the Cutler way. Am surprised he wasn’t talking to his mom on the phone when he was on the sideline.